Emma Tatsch homered to right field, scoring two runs to lead China Spring over the Salado Lady Eagles in the bottom of the seventh of their first game in a best-of-three series for the Region III 4A Area playoff. 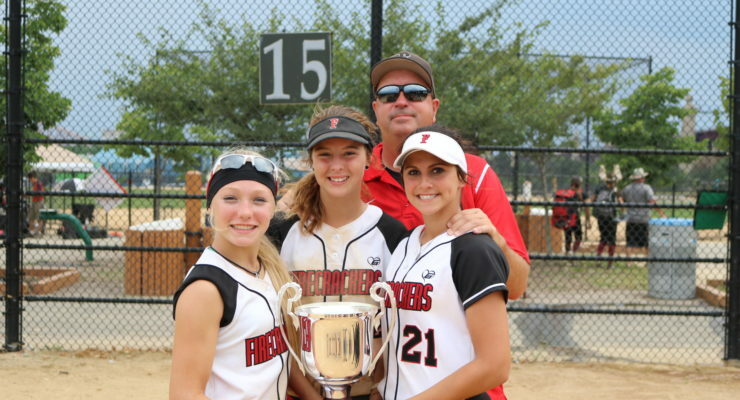 Salado will play game two at 11 a.m. May 5 at the Waco ISD Sports Complex. Game three, if necessary, will be played 30 minutes after game two. 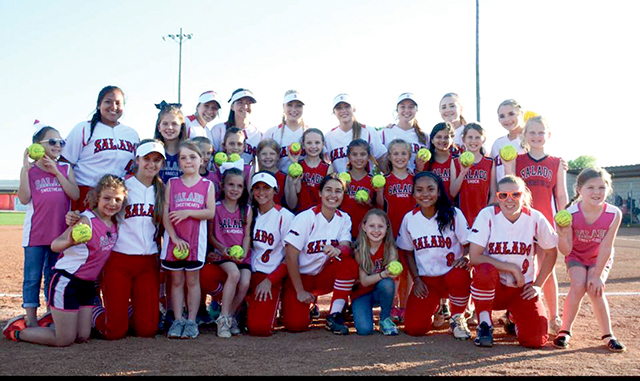 Salado Lady Eagles will face China Spring in the Area Round of the UIL softball playoffs with a three-game series beginning May 3. Games are scheduled to be played at the Waco ISD Sports Complex (1401 S. New Road) at 7 p.m. May 3 and 11 a.m. May 5 with the third game (if necessary) to follow 30 minutes after the conclusion of the second. China Spring, the third place team from District 17-4A, beat Mexia, the second place team from District 18-4A, in two games: 6-1 and 11-0. 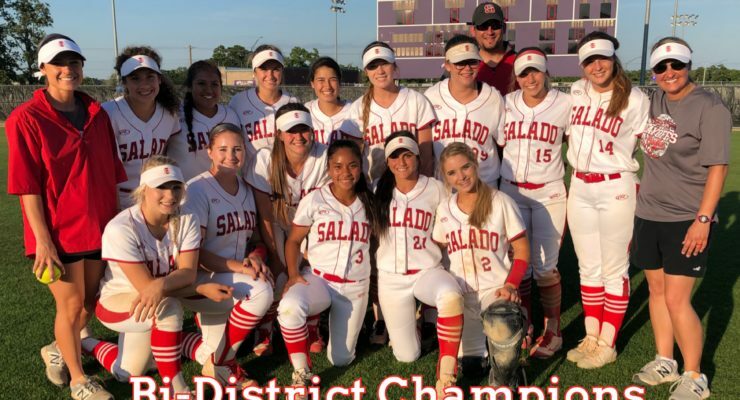 Salado swept Navasota in the Bi-District round of the playoffs, ending both games by the Run Rule with victories of 10-0 on April 26 and 14-1 on April 28. Liberty Hill, the runner up in Salado’s District 19-4A, beat Giddings 5-1 and will face Gatesville in the Area Round. Lampasas (third place in District 19-4A) lost to Caldwell 15-10 and 12-6 in the Bi-District round and Leander Glenn (fourth place in District 19-4A) lost to LaGrange 7-1 in the Bi-District round. The Llano Lady Jackets briefly led Salado in their district softball game on March 29, scoring two runs in the top of the first. Salado Lady Eagles are alone at the top of District 19-4A with an 11-3 win over the Taylor Lady Ducks at home on March 23. The win improves Salado to 6-0 in district and 15-3 overall. Salado Lady Eagles are alone at the top of District 19-4A and propelled themselves into the Top 15 in 4A softball when they beat the 12th ranked Liberty Hill Lady Panthers 4-3 last week. 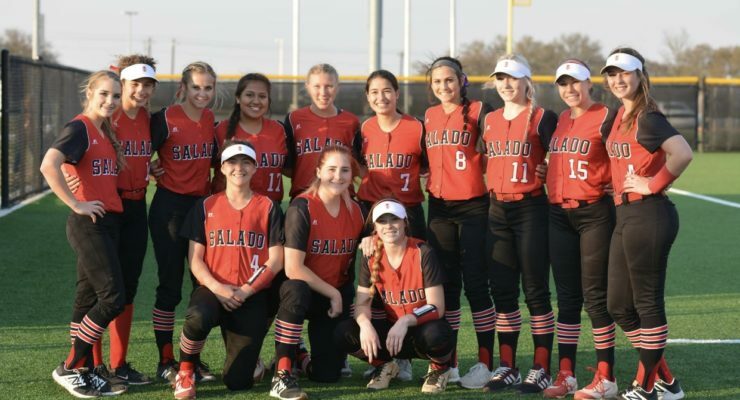 Salado Lady Eagle Softball team starts district this week after taking first in the Silver Bracket of the Franklin Tournament March 1 and 3, where the girls faced six good teams. Jan. 29 Scrimmage - Harker Heights Away 4:30 p.m. 6 p.m.
Feb. 3 Four Way Scrimmage: Florence, Rogers, China Spring Here 9 a.m.
Feb. 6 Scrimmage Reicher 5 p.m.
Mar. 6 Llano* Llano 5 p.m. 7 p.m.
Mar. 9 Lampasas* Home 5 p.m. 7 p.m.
Mar. 13 Leander Glenn* There 5 p.m. 7 p.m.
Mar. 16 Burnet* Here 5 p.m. 7 p.m.
Mar. 20 Liberty Hill* There 5 p.m. 7 p.m.
Mar. 23 Taylor* Here 5 p.m. 7 p.m.
Mar. 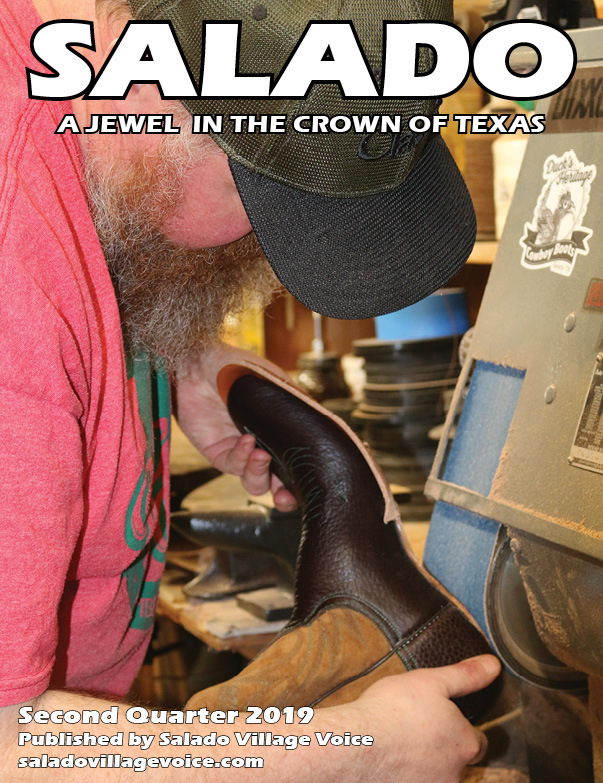 29 Llano* Here 5 p.m. 7 p.m.
Apr. 3 Lampasas* There 5 p.m. 7 p.m.
Apr. 6 Leander Glenn* Here 5 p.m. 7 p.m.
Apr. 10 Burnet* There 5 p.m. 7 p.m.
Apr. 13 Liberty Hill* Here 5 p.m. 7 p.m.
Apr. 17 Taylor* There 5 p.m. 7 p.m.
* District Game. Head Coach is Ashton Cooper. Feb. 13, 2017 Clifton Clifton 6 p.m.
March 7 Llano Salado 6 p.m.
March 10, 2017 Lampasas Lampasas 6 p.m.
March 16, 2017 Leander Glenn Salado 6 p.m.
March 17, 2017 Burnet Burnet 6 p.m.
March 21, 2017 Liberty Hill Salado 6 p.m.
March 24, 2017 Taylor Taylor 6 p.m.
March 31, 2017 Llano Llano 6 p.m.
April 4, 2017 Lampasas Salado 6 p.m.
April 7, 2017 Leander Glenn Leander 6 p.m.
April 10, 2017 Burnet Salado 6 p.m.
April 13, 2017 Liberty Hill Liberty Hill 6 p.m.
April 18, 2017 Taylor Salado 6 p.m.
Assistant Coaches Ashton Cooper and Mirah Wilcox. 02/14/17 Clifton High School Lady Cubs Clifton High School 06:00 PM JV 4:30 p.m.
03/07/17 Llano High School Lady Yellowjackets 07:00 PM JV: 5:00 p.m.
03/10/17 Lampasas High School Lady Badgers Lampasas High School 07:00 PM JV: 5:00 p.m.
03/14/17 Leander Glenn High School Lady Grizzlies Tom Glenn High School 07:00 PM JV 5:00 p.m.
03/17/17 Burnet High School Lady Bulldogs Burnet High School 07:00 PM JV 5:00 p.m.
03/21/17 Liberty Hill High School Lady Panthers 07:00 PM JV 5:00 p.m.
03/24/17 Taylor High School Lady Ducks Taylor High School 07:00 PM JV 5:00 p.m.
03/31/17 Llano High School Lady Yellowjackets Llano High School 07:00 PM JV 5:00 p.m.
04/04/17 Lampasas High School Lady Badgers 07:00 PM JV 5:00 p.m.
04/07/17 Leander Glenn High School Lady Grizzlies Tom Glenn High School 07:00 PM JV 5:00 p.m.
04/11/17 Burnet High School Lady Bulldogs 07:00 PM JV 5:00 p.m.
04/13/17 Liberty Hill High School Lady Panthers Liberty Hill High School 07:00 PM JV 5:00 p.m.
04/18/17 Taylor High School Lady Ducks 07:00 PM JV 5:00 p.m.
Three Salado High School Freshman girls, along with Firecracker Head Coach Mark Brown returned to Salado Monday evening after the DFW Firecracker Gold 14U Softball team went undefeated to win the 2016 Triple Crown Sports USA Platinum National Championship in New York City, New York. The game was televised Saturday on ESPN 3.